Stay on top of all important Stonemaier Games news and announcements by subscribing to our monthly e-newsletter. You’ll be the first to know about new releases, rules errata, and special events for our games. We will not spam you or send your contact information to anyone else. iOS Viticulture? Yes please! Where do I sign up to beta-test? I hope that means you’re planning to not stop there, and also introduce an Android version – being able to play across the two platforms would be an important feature in my household, as I just invested in a Samsung Galaxy S4 for me, and a iPhone 5c for my wife. That’s a neat idea–I’ll mention it to Morning Players. That aspect of the game (printed European language components) is completely in their hands now. And EU languages… Neat! Are the using the ks translations, or their own? They have their own in-house translators, but they said they were really impressed by the quality of work our backers produced on the translated pages! Jamey, will Tuscany, or as part of the Kickstarter, include a properly printed copy of the 2nd edition Rules? Dan: Tuscany will include the quick-reference guide for Viticulture that includes all of the updates to the rules. Will we be able to buy Tuscany and 2nd edition Viticulture at the same time? Yep! We haven’t finalized the price points, but they’ll both be available through the Tuscany campaign. I’m flattered to hear that! Thank you. I greatly admire Feld and what he’s done. 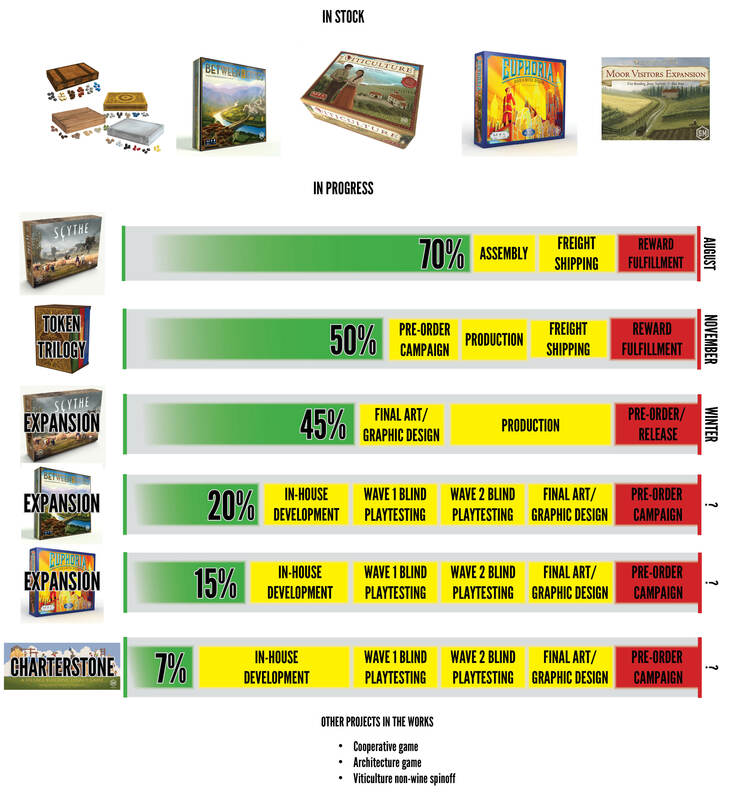 Do you think that for the second edition kickstarter for Viticulture and the new Tuscany exp. we might also be able to get the Arboriculture exp? Tony: Yep, Arboriculture will be an optional add-on for Tuscany. Viticulture is an optional add-on as well. Exciting news, Jamey! Looking forward to it! Excellent news!! I’ll consider the 12 March Kickstarter date as a slightly belated birthday gift to me. Will the March 12th kickstarter also include the 2nd edition? Yes, the second edition of Viticulture is an add-on with Tuscany. Will both viticulture and tuscany ship together if bought through the kickstarter? Martin: At the lowest price, yes. There is a slightly higher price that will get Viticulture to you in August, followed by Tuscany in November. Jamey – it’s may be too early for you to know, but would the Viticulture delivery carrier be one who would allow me to schedule my August delivery? Doug: I’m not sure I understand your question…we’ll use Amazon fulfillment to deliver Viticulture and Tuscany, and you’ll be able to choose through Kickstarter if you want to deliver the two games together in November or separately (so you can get Viticulture in August). Sorry I was a bit vague but you’ve answered my question. I have travel for work scheduled in August. However I’d like to get Viticulture then. If your shipping is handled through Amazon I should be able to get a notification of shipment, along with a tracking number and then be able hold the shipment if its delivery doesn’t sync with my availability. Yes…Yes…I know I could be patient and wait until November for both…..well…no I can’t. This turned out to be a great day. Work closed do to snow AND I’ve backed Tuscany/Viticulture! Regarding the Updated Recruit cards… will they be the color faces or the line faces? We really like playing with the line faces deck and would pay extra to get those updated to 2nd edition. Noah: They’ll be the recruits with faces. We have to print minimum quantities of 1500 sets, so it’s not feasible for us to print two different versions of the cards, especially since we’re including them in the Treasure Chest for free. Hi! Is there any chance for the revised recruit cards to be available at Essen please ? As EU backer, it would be awesome! If not, is there a file we can print soon? Aurelien: The recruit cards will be printed and shipped with the Treasure Chest, which won’t arrive in Europe until December/January. Sorry! Still thinking about buying lewis & clark. did you like it? And do you like belfort? have it here but not played yet. Did my first round of the newly released La Granja – nice heavy eurogame. Malte: I love Belfort. It’s a great, tight Euro game. I enjoyed my first play of Lewis & Clark–very clever mechanisms. I’ll check out La Granja. @JAmey: Does the fact that Euphoria will be in Essen imply that YOU will also be in Essen? @MK: The implication is there, but the truth is that I won’t be at Essen this year. Are you going? Dermott: I think there’s a chance of that. I’ll mention the idea to Morning Players, the company handling the production and distribution of the German version. Hi Jamey, Is there a link somewhere that I can use to find out more information about your Design Day in November? Hi Gordon: The only information about it so far has been in the e-newsletter (archive files here: https://stonemaiergames.com/e-newsletter/). Jamey, might we see another Euphoria kickstarter in 2014-2015? Just wondering if I should get the 2nd edition or hold out? I would recommend getting the second edition, as we currently have no plans for a Euphoria Kickstarter in 2015. Even if we end up doing one, there’s a good chance it would only be for the expansion, not the core game. Hi Jamey. I couldn’t find anything specific on the collector’s edition with the wine box, etc. Is this grouped with the Tuscany delivery? Hi Barry, yes, the Collector’s Edition is part of Tuscany. Ryan: Several of the farmers on the box are holding scythes. The C is evocative of a scythe–it’s just a play on the idea, not an exact representation as shown in the art. Jamey, have you heard if Tuscany for US backers has arrived at Amazon yet from the Panda warehouse? I see you have an estimated delivery date for Tuscany at Dec. 21, but also show an arrival date to Amazon for the treasurer chests, stars, etc. I picked up the CE since I had never played Viticulture before. I may have made a mistake yesterday by watching a bunch of the reviews and run through videos. Now I am incredibly jacked to play, and hoping that I can take it with me on my Christmas vacation to play with the family. I am praying Christmas will come early and I will have the incredible wine crate of goodness to open soon! It wasn’t until afterward that I realized the question might have been asking if I would pay for being able to play Viticulture the game as an IOS app, which I would indeed find interesting. Maybe I’m the only one too slow to pick up on what you meant, but in case I’m not the only one who thought that, maybe the question could be worded in some way to specify that it would be the game as an app, rather than simply an app about the game. Keep up the great work! The tokens and landmarks have piqued my interest about Between Two Cities. Oh, and the inclusion of the Power Grid elements in the next Treasure Chest would be amazing! I held off on the last one despite liking the concept because I didn’t own many games with perfect overlap between the offerings and items in the game; I’d hate to have great tokens for Caylus’s gold, stone, and wood and still use little blue and pink cubes for cloth and food. But a chest that covers oil, coal, trash, and uranium would be great. Just saw the newsletter that there might be some Stonemaier tournaments at GenCon…which games are we thinking? I’m curious if you will be making more euphoria wooden stars sets available on Amazon.ca. Currently there are none available. Claude: I’m sorry, but we’re all sold out of stars in Canada. It was a limited print run. We do have more at Amazon.com in the US if you have a way to order from there. Do you know if your crowdfunding book will be available in the UK? I’m refering to the paperback version. I work as a shop level bookseller for Waterstones (the UK’s book chain) and would love to see it in store over here so was thinking that if it had distribution in the UK then I could bring it to the attention of our buyers at head office as something well worth them considering. Sometimes it just helps to bring things like this to their attention, they see so many products come through. Lloyd: Thanks for asking about this! I don’t think it has international distribution yet. If there’s anything I can do from my end (i.e., introduce you to BK or send you a galley), please let me know. That’s a shame about international distribution. I expect it will come in due course! I will do a little digging on this end; I know some things we can order through Baker & Taylor (book wholesalers Waterstones use to source American authors) for customers by request, if the book is on our internal stock database. I’ll find out how it can be added at least. According to Nielsen bookdata it has UK distriubution via McGraw-Hill Publishing (they do business and computing books and are pretty well known). The ‘release’ date for the UK is 20 December, as last updated on 19th jun. I shall pursue putting it to the attention of a buyer. Mike: As I replied to your comment on the project update, that’s the third poll on the page–it’s been up for a while. Lionel: The resources in Scythe are grain, metal, wood, and oil, so by sheer coincidence one of those resources is in one of each of our first four treasure chests. We will probably offer those resources as part of Scythe for those who don’t have them and only want them (at a price). Oh let me get this straight, you mean we could get the chest ressources as an add-on during the KS campaign? THAT would be awesome..
Not as an add on, but as part of the Scythe collector’s edition on Kickstarter, and only for those 4 specific resources. Good news. It’s going to be a blast! thx again Jamey and please keep up this good work. A shame about the need to split the Tuscanny expansion into multiple parts, but the fact the expansion is more than the base game makes this not particularly a surprise… And, lets face it, any other publisher would have likely released the 12 modules of the Tuscany Expansion between either 3-4 large box expansions with 3-4 modules in each, or 6-12 small box expansions with 1-2 modules in each (Maybe combining New and Advanced visitors into a single module) originally, so even if you split it into two boxes, it would still feel like two huge expansions. Loving the presence of metal coins in Deluxe Scythe – Will you be selling these seperately like you do with the Tuscany coins? And, if so, how easy for you would it be for you to sell additional sets as an addon so people who want to can keep one in Scythe where they thematically belong, and one outside of it because these coins look gorgeous based on that art and not every game has a quantity of money that suits Tuscany’s 1 2 5 combo – Though not sure how big a market there’d be for that. On a practical point of view will the cardboard coins be pre-punched or punchboard? the 1 denomination from the Crimean Khanate’s hole might be awkward to punch, though probably that will just be a brief annoyance to people getting the retail version while they punch it and they won’t ever have to think about it again – I think tokens with holes in have tended to be worth the pain to punch, even if the hole is purely aesthetic. At some point, it would be interesting to get a guest post – either on the campaign itself or on the blog – from Jakub Rozalski on the world building for this project, and how he’s approached the art for it. Particularly for these coins, I’d be very interesting to know more about the process of designing them since they’re based on real historic coins but translated into the alternate history world he’s been building. A bit off-topic, but I noticed Pay Dirt in your list of recently played. I have a friend who “dreams” gold mining (she’ll never do it in reality). She also likes strategy games and economic-sim type games. Do you think there’s enough “theme” in Pay Dirt to interest a would-be gold miner? BTW, missed Viticulture the first time around but will definitely pick up the reprint through my FLGS. Glad it’s doing well! James: There’s plenty of theme in Pay Dirt! The theme is well integrated in the game, and there’s a nice engine-building element to it. Viticulture should still be available at your store–it’s just that your store won’t be able to restock for awhile. Thanks!! — now I can add two more games to my buy list (gulp). Hey Jamey, I’m seeing Tuscany and Tuscany Prima out of stock at coolstuffinc and miniature market. In stock at Amazon but marked up. Will Coolstuff or Miniature Market get them back again or are you saying it’s done? Gabe: Tuscany Prima is out of stock for good, but as far as I know, we still have Tuscany in stock (and the coins are at Meeplesource for those who want to upgrade their copy to Prima). Hopefully Coolstuff and MM will buy more copies! Sooooooo… how might one get in on the blind play testing of the Euphoria expansion? And am I correct in assuming that one will need the base game in hand already? Eric: Yes, you’ll need the base game. I’ll contact all ambassadors with an opportunity to blind playtest it when it’s ready. …A Secret Project that’s going straight to retail? Are you allowed to give teasing hints, for example saying if that relates to the e-mail conversation that lead to Viticulture EE? Have you posted news about the limited supply of components for Scythe and other games in their appropriate forums on BGG? Not too hard to find a BGG’er who thinks a company has an infinite number of games in stock, or has somehow missed your KS or retail release news, despite all your hard work and advertising. C: I haven’t done that, though it’s a good idea. Should I just start a thread about it under Scythe, or is there a better place to post something like that? Hi Jamey, I just heard some info on a new game spinning off from the Euphoria universe. Can you tell us a little more about it? Thanks. Now he is locked in my shed. Erik: That sounds like a reasonable response. :) Make sure he’s fed daily! Is there going to be a way to get the realistic resources with the Scythe expansion? David: Perhaps. I’ll consider that. Just a point to maybe take on board for the future … the in progress colour bar showing the various projects and current expected releases etc shows “Winter” for the Scythe expansion. Now I appreciate that the (vast) majority of those likely to buy that expansion are in the northern hemisphere and this makes perfect sense to them, but I looked at it and initially thought “what! another 12 months (sigh)” before i realised the context. So maybe it might be possible to change it to “late 2016” or “early 2017” or something equally all-encompassing, just for those of us in the antipodes. Just a thought. Also, is it at all possible to order comments on this page to “most recent first”? Is that a user-end thing? Sure, that’s a good idea about the progress bar. I’ll update it. I prefer this format for contents on my blog–it’s global across all pages on our website. Gab: Of course! The game will ship to you from retailers in Australia, or you can even pick it up from your local game store and not need to pay anything for shipping. Did I hear you correctly in some podcast that the Euphoria expansion will include the Automa system for solo play? I could be mis-remembering. I do not currently own Euphoria, but am certainly interest in the game for my group and for solo play. Also, now that I finally have Scythe, it is beautiful and I am giddy in thinking about finally playing it this weekend. I am also looking forward to throwing more money at Stonemaeir for upgraded components. I have seen them in person and they are wonderful. So, when is the Scythe expansion due? Preorder? And would it be possible to get matching combat wheels for the two new factions? The Scythe expansion will arrive at retailers (only through retailers) in November. We haven’t designed power wheels for the expansion yet, but we’ll sell them through Meeplesource sometime in 2017. My retailer has sold out of preorders for this game. Is there anywhere else? Will there be more or is it a limited run? Which game? We’re making more of all of our games, so you’ll be able to get it soon. Thanks, Jamey. I was referring to the Scythe expansion. As long as I’ll be able to get it at some point, no worries. Ah, I see. They should be able to continue to accept pre-orders–maybe not for the stock arriving the first week of November, but definitely for the stock arriving a few weeks later (we made a bunch of copies that will arrive in waves throughout November). Wow – super disappointed with the pricing on the upcoming animal premium tokens!! There doesn’t appear to be a “chest” available for them, and if I purchase 20 of each (and let’s be honest, there were usually a few more than 20 in the chests), it will cost $127, and that’s with no storage box! I’m more than disappointed, I’m outraged at the price increase over previous offerings! Kristi: They’re big tokens, and the level of painting makes them more than twice the cost of our other tokens. 2x cost = 2x price. (Though you’re still welcome to be disappointed, of course!). As you noted, a chest with 20 of each animal would have cost over $100, which did not seem like a good idea. Do you have any pictures of this next to wooden counterparts for comparison? If they are so big, I wonder how they will fit on games like Agricola and ACBS. Twice the price I could stomach. Quadruple the price not so much. When you sold realistic tokens directly I believe they worked out to roughly $30-$35 per chest? And that was with counts in the mid-to-high 20s for each resource. Now only 20 of each animal would be about 4x that, not double, due to going through a retailer. I don’t begrudge you the right to sell however you want or for the retailer to make money, but after all the input we realistic resource KS backers gave you during the design process it’s beyond disappointing to be left flapping in the wind. You received a significant discount on previous chests. Their MSRP was $60, and even that was deflated from what it should have been based on manufacturing cost (the Terror Tome, for example, should have had an MSRP of $80). I’m sorry you feel like your input isn’t valued, but that’s simply not true. I highly value it. I hope in return you value the significant discounts I’ve given you in the past by supporting the animal tokens at a fair-market price. Looks like the Automa deck is already sold out :-( Should have bought it while I was at work! Do you plan to restock again, and if so, when? Thanks! Lon: Indeed, every time we get a new shipment of Scythe, we’ll have more Automa decks (we pull them from the replacement parts). They’ll be available in a few weeks. Jamey, my sons and i picked up scythe and we are addicted, this game is brilliant! We have been suggesting it to everyone we know as well as having game nights at the house with all my son’s friends who are all in the military as officers (4 of them) and as a former marine myself its crazy entertaining to watch all the different tactics produced by military minds. Thanks for creating and sharing this game with us and we will be purchasing and backing games from you now that i know these are kickstarted. I was also curious if you plan to continue having more of the premium coins and resources made for sell as most preorders are sold out or if this is the last time, thanks! Hi Jamey – just recently received by Token Trilogy pre-order and… yeah, fantastic as always! Well done. I seem to remember reading a post somewhere about the next set containing reed. Is there a discussion thread about the next set or any hints yet about what that set will consist of? Also, any target timeline on when the next set might come out (recognizing that any answer you give might be pure speculation at this point)? Lastly, are the Animal Components being offered as a complete set or just individually through specific retail sites? Or is that each site’s choice? Mark: Thanks for your questions. The tokens we were considering for a farming chest were reed, wheat, cheese, fruit, vegetable, and mushroom: https://docs.google.com/spreadsheets/d/1CeIwkPr3NnbU9DeySmztlhxoOhL9E6nvrepkrYzr9Xg/edit#gid=73895490 I’m not 100% sure we’ll actually be making those tokens, though, and if we do make them, we may sell them individually instead of as a complete chest. As for the animals, they’re available in various forms from Top Shelf Gamer, but there is no complete boxed set of them (it would be over $100, which is just too much–the animals are really expensive to make). There are some bundled deals for specific games, though. Thanks Stephen! I’ll give you editing access. :) It was open-access for a while, but I’d check in and see some really weird formatting changes that didn’t help. I assume ‘Tuscany:EE More Coming in February’ is into the USA? Are some of these likely to make it to UK? and do you have an idea when they would arrive here? Ian: Yes, that’s in the US. It actually should arrive in Europe a little earlier than that, as a few distributors in Europe bought copies directly from us before they left the factory in China. Great thanks Jamey, looking forward to picking it up – and thanks for responding so quickly! I have a copy of the Adventure Atlas preordered at an OLGS (Cardhaus). Is there a time frame that those will be restocked at the distributor level? I saw above that Top Shelf Gamer got individual parts, but there was no mention of the boxes themselves. Paul: Thanks for letting me know. That’s an out of print product–they shouldn’t be accepting pre-orders for it. We’re only making the individual tokens now. That is a bummer. I’ll message him as see what we can do. Hi Jamey, i’m from Spain and i’m waiting to play Scythe for the first time when i receive the realistic resources. I have a pre-order on boardgame extras UK and they say will be avaliable in February but in others stores say the date for Europe is in June. Do you know when will be avaliable in Europe? I’ve read the rules a few times and i’m looking forward to playing. Javier: BoardGameExtras ordered those resources directly from Top Shelf Gamer, so they should have them quite soon (a few weeks at most). I was wondering if those dates on the image you have for the retail releases are accurate? That seems a lot sooner than I thought for Charterstone and the Scythe Expansion. Nick: Absolutely! I just updated this chart yesterday. I read the Q’s as 0’s as well but it/I were obviously wrong. Yeah, they’re a bit small. Sorry for the confusion! Your email newsletter and level of communication are almost as impressive as the components in your games. Thanks for making such awesome stuff! Just one point of errata. Your latest newsletter’s progress bar for Charterstone lists it as releasing on Mar 3, 2017 directly underneath the bar. You mention earlier in the newsletter that it will be releasing “much later” in 2017. The progress bar on this site is missing that bit of detail. I am assuming the March 3rd date is way off? I’m cool with that. Take whatever time you need to make more awesome stuff. Ha! My old eyes and my eagerness to try out Charterstone must have gotten the best of me. Hi Jamey, the survey was a nice initiative. I was actually really surprised with the “exclusives” responses. It might be however that the sample (SMGames friends and followers) is not representative of the general gamers population. I also felt that the questions didn’t fully capture my sentiments about such incentives therefore I decided to share my views below. For starters I do believe that there should be incentives (we do risk investing our money on something we haven’t really seen or experienced yet at the end of the day). Someone on the other hand might say that KS is all about helping to bring to life a game that otherwise wouldn’t exist. Sure, but there are so many great games out there, enough to keep us busy us for 5 lifetimes. Maybe that was more true in the early KS days. Second, I despise scalping practices on games with exclusives in the form of extra content (see CMON), however exclusives could also exist in an aesthetic form. E.g. a special limited KS box cover would be an attractive enough reason for me to back a game, something which wouldn’t reduce the utility of the game for the retail buyer. The same as with a signed copy, or a special thank you card. These things have primarily emotional/personal value and its a memory that we were part of something. I also pretty much dislike early birds. If we assume that the KS and retail versions are identical, I can’t accept paying retail price + shipping on a game that 1 month post-release will be bought for less (and without shipping) from all major online retailers. Especially after taking the big risk of investing on a prototype. Under this light a universal guaranteed lower price (compared to the online retailer’s MSRP) would also be a good incentive to risk my money and much more preferable than the early bird practice (many of us have better things to do than waiting for the countdown of every KS campaign in order to grab a $5 dollar discount). These are only a few thoughts that maybe other people share but the survey didn’t capture entirely (namely, non content based exclusivity & universal discounts). As always, thanks for the awesome content! Hi Jamey. There were a couple of mentions in the last newsletter that you have been posting information about Charterstone & the new expansion for Between Two Cities on Facebook. For people who don’t use Facebook & use Board Game Geek to keep up to date with the gaming world… just wondering why you seem to be favouring Facebook & not really giving that much info on BGG? Steve: I like the visual element, organization, and interface on Facebook. BGG is great, but I don’t get a sense of community built around specific games there. The community is there, to be sure, but it’s not centralized in the same way that a game-specific Facebook group is. I’m very active on BGG, though–I’m always happy to answer questions there. Yes, it will be available in French in October/November. I got into board gaming in the last few years and with saying that have only been following you the last few months (since I’ve heard about Charterstone). I must say, you are by far my favorite developer. The mass of content you put out, the outreach you have in so many forms on social sites and the like is purely outstanding. I’m working on a game myself (super slowly) and again, you are the example that I believe everybody should follow. Keep up the great work and thanks for being always present. Jamie, I’m interested in your opinion of Anachrony. “I bought most of my non-kickstarter games at…” conventions! To further articulate on my survey response: though I chose online purchases as what I do most, i would still say I do about 35 to 40% of my purchases at flgs. Also I like competitive and co-op games almost the same amount. Just trying to be clear. To further iterate on mine – I do 95% of my board game purchases via my FLGS, and 100% of my accessory (e.g. Stonemaier resin tokens) purchases online. The 5% usually being when I wind up buying a board game at the same time as accessories. Another clarification for my survey while I remember – I prefer competitive as long as there’s a two player version, for co-op games I usually wind up playing them solo – which is a form of play I enjoy anyway, but for co-op gaming I need the game to be able to be played solo for me to consider picking up, for competitive two player games I don’t necessarily need a solo mode, it just helps if I’m unsure if my husband will enjoy the game or not. I put on the survey that I prefer competitive. Your survey needs a comments section. I’m kind of color deficient, not color blind, but many of the ways to adapt for color blind work for me, but not all. And something I look at when buying a game is the solo-ability of it, something missing in your style question. I notice you’ve started putting codenames for these various unannounced projects rather than ‘submitted game’ or ‘Jamey design’ – Quite often people and companies have methodologies they use for codenames, like Magic R&D at one point were doing triplets with unambiguous orders for the three sets in each block, e.g. one of the blocks had codenames of lights, camera, and action. I’m curious if you’ve got a methodolgoy for coming up with codenames. Indeed, I decided to go with codenames to add a little spice and curiosity. :) There’s no common thread between then, just very subtle hints at what the games are about. That ‘combo’ codename seems interesting. Are you teaming up with another designer for a game, Jamey? Like maybe Isaac Childres? Or maybe Ryan Laukat? How about both! Hahaha! That would be amazing! Two distributors I know of are out of the Scythe base game, and one is out of Invaders from Afar. Any chance there’s a reprint of those two coming with Wind Gambit? Also, has there been a decision on whether to reprint the board extension? Of course! If we sell out of something, we’re reprinting it. :) We have large print runs of all of those items wrapping up production now, and they should reach stores by early December at the latest. Coolstuffinc.com has Scythe and the expansion in stock. 1) I’m in love with the world of Scythe, and I am also very proud of my Scottish heritage. While I appreciate the integrity of what you have chosen to release as merch with Scythe content on it, I would love an Albion Shirt with the faction logo on it…are there any plans to release faction specific shirts? Bumper stickers? 2) I see you’re playing Ulm…what do you think of it? It has been on the short-list for a while, and lost out this year to Orleans. I would welcome your thoughts. I’ve only played Ulm once, and it’s been a while, so I can’t speak about it with much knowledge at this point. Hey Jamey – was going over the November newsletter and remembered about a game you talked about with the Dukes of Dice seems like forever ago now. I relistened to that episode because I had meant to reach out to you at the time and never did. Is the “bird game” you talked about still in the works? I could take a stab based on the codenames above that it is ;) I am a huge lover of both birds and board games. I wish I would have reached out to you earlier, but if there’s a way that I could help in any fashion (play testing, the “science” behind the theme, etc) please let me know. There are very few games that fit so snug into both my hobbies that I felt it imperative to reach out. Lindsay: You have a good memory! I’ve hinted at that game but haven’t formally announced it yet. :) If you’re interested in playtesting it, send me an e-mail at jamey@stonemaiergames.com and I’ll send you some information. Hello! I recently deactivated my FB for the holidays (I do it every year), so I’ve been out of the loop on all things Stonemaier! :) Any news on the eagerly anticipated Viticulture iOS version? Can’t wait! I am lost in all releases and would like an “all-in option”! Fel: Thanks for your interest in all of the Scythe things. We prefer to let people pick and choose the things they want instead of making them buy all of the things for a very high price. There are several bundles on this page that make it easy for you to buy everything Scythe related. First Huge French fan of Scythe, so I pre-ordered the Wind gambit as soon as it was possible. I also have every bit of “extra” available for Scythe, so this has became quite an expensive game for me but I really love the awesome edition. However upon recevin the expansion and opening the box, I as really disapointed, not to say kinda furious, to see that there were already errata on what looked like a really small and simple translation job. The expansion is quite expensive here in France (35€, about half of the base game price), so I was expecting regular translation job, not something riddled with faults, missing words, or sentences that make no sense whatsoever. The errata in the expansion doesn’t even list all the mistakes. Do you know if anything is planned to fix it? Or maybe you have some way of getting in touch with matagot about it? Meek: : Well, we all make typos, even in short batches of text. We expect our international partners to both translate and proofread properly, but we also put our partners under a lot of pressure to do all of this on a tight schedule so the international releases can be at the same time as the English release, so I understand that mistakes can be made. When I see people complaining about an extra “s” in “resources” (on a different thread), I wonder if they’re just stirring up trouble for the sake of drama. So in my opinion, the current translation is “normally translated.” However, I know that Matagot has heard the complaints and are updating the rules. If I were them, I would just post a revised PDF on their website. However, they may choose to print extra rules to appease their fans. Hum so you feel it’s normal that there are so many translating mistakes? You make it sound like it’s just some letter not doubled in a word or two. It’s much more than that, it’s missing words altogether, it’s sentences that just make no sense it’s multiple typing or french errors: this is not possible with proofread, especialy when there is so little to translate for something that’s quite expensive (half the base game). I’ve seen the mistakes, and some of them are indeed a problem. I’m talking to Matagot about it. But it seems that the people reporting the mistakes are lumping very minor errors in with bigger errors–they’re not the same thing. It’s really unfortunate that people are rating the quality of a game based on a subpar translation. Of course I’m frustrated that it wasn’t a perfect translation, but I’m disappointed that fans of Scythe would act this way. You have the right to demand excellence, but how do translation mistakes translate into a 1-star rating? I bought it at my local game shop, hence why I paid more, so I didn’t leave a feedback, but even as fan of scythe, who paid premium to get all the bonus (missed the KS), I was highly disapointed to say the least when I saw it. Trying to get an aswesome looking game to end up with stuff that is not even proofread really. I don’t really care about the rule as people don’t read those once explained, but at the printed material used in game. I was really hoping for Matagot to bit the bullet, and offer replacement but it doesn’t look like you think that’s even a possibility. I understand your disappointment–I would be disappointed too if I was unable to play a game due to a poor translation. As I said, I’m a true fan of Scythe, spent quite a bit of money acquiring everything you release since I missed the KS. However it kinda ruins it, when gameplay component are riddled with translation issues, some of which clearly show there was no proofread at all. I personnaly bought my exp pack at my local game store, hence why I paid extra, so I did not put 1 star, even though I kinda understand them, only way to make a point really. I’m not even sure if Matagot made an official reply on the issues ? I don’t really care about rule with typing mistakes (it’s poor job but it doesn’t impact my game). But I would have really liked that Matagot bite the bullet and offer to reprint the gameplay content. Either way, always impressed by the speed at which you reply on here, thanks for taking the time to aknowledge the issue. Sorry for double post, thought I canceled the previous reply in time. You can delete one of the message. Off to sleep, thanks for taking the time to reply. I would like Matagot to post an official response too–I’ve asked them if they will do that. I’d like to know more about the typos on the tiles in the game. The rules are one thing, but that’s an easy fix with a digital download. The tiles present a bigger issue because they’re on the table throughout the game. Can you tell me more about that when you wake up tomorrow? Is there any hope of the Treasure Chests being reprinted? I had looked there, but they are out of the stone. I need ore and stone as separate resources for Archipelago. Ah, I see. Could you use the iron ingots as ore and the metallic stone as stone? Hi drphogg. Chad from Top Shelf Gamer here. We very recently got a very limited supply of the stone tokens. I’ve put them as available now. Please order quickly, though, due to the small amount we have. Thank you two so much. Ordered. The only thing I need now are some tropical fruits. Any news on Viticulture for iOS and/or Android? Not yet, unfortunately. But I’m hoping to have more news soon. Sooo excited about the final Scythe expansion! It sounds exactly like what I would have wanted for this fabulous game. 11 modules, and a resettable campaign!! Amazing. Board game news is off to a great start in 2018! Can’t wait to hear more about this. I am happy to see the Airships minatures for purchase in the website, any plans to do the same with the Mech’s of each faction. I see a bundle of Mech’s and Leader’s but i already have a extra set of Leader’s. An option to purchase just the Mech’s of all factions as a bundle would be greatly appreciated. Love that you are playing this game. Nicholis: We did it all in one session (multiple runs…maybe 6 or 7). We totally forgot about the completion rewards–they definitely would have helped! Need more help with the transcribing now or in the future? I assume you probably had more willing volunteers than you needed, but if that changes, I’m game. Thanks for providing this service. Captions /transcription is so useful. Any ETA on when shirts for ambassadors will go on sale? This system you’ve got now feels much better than announcements of announcements, which often irritate me, somewhat because it’s more tangible, which makes it interesting rather than eye rolling. It’s hard to convey this in the chart, but many of these projects–including combo–are in multiple stages at the same time, including art. Hi, I bought Charterstone for a Christmas present for friends so we could play together, and “discover the game” as we built our friendship. It has worked beautifully, all involved are very impressed and it achieves what a good game is meant to do, inspire better human relations- thanks for the hard work- looking forward to more “reveals” as as we continue our journey in this interesting game-world! As I was putting Viticulture away Sunday night it occurred to me that this would be easier and faster with the Game Fit box insert. Is there any way to get a U.S. distributor to pick that up? Maybe! I don’t know what Game Fit is, but if you contact Game Fit, perhaps they will consider contacting US distributors. They make a decent box insert from what I have read. If it’s unauthorized I was unaware. Some folks at BGG had discussed it. Yeah. It’s like Broken Token making stuff for Lords of Waterdeep. They’re just accessories and not official products. Ooh a new Viticulture expansion! Really excited for that one. Curious to see what new options it will bring. My goodness that Euphoria expansion seems to be taking forever! It was Euphoria that introduced me to the Stonemaier brand – the first time we played just blew me away! Can’t wait to see what the expansion holds! I really like the new in progress chart. Much clearer than the old percentage version. Yes, it looks very interesting. For color blind people it would probably help them if red has diagonal lines in it, or was black, or white with a black outline. How many months does it take from pre-production until it is on the ship? 4 months? Combo doesn’t have a solo mode, interesting. Does this mean its a party game (can’t be) , or a 2 player only game, or has a mechanism that doesn’t work well in solo mode (like deduction, auctions, etc)? Pre-production to ship is 4 months on average if you’ve already finalized all of the non-printed components. Otherwise it can take much longer. For combo, we just couldn’t get a solo mode to work. If we figure it out, we’ll put it in an expansion. Seems combo will have to be in pre-production in June to avoid the crazy December shipping. And eat a shoe in April to meet it’s release deadline. If you meet your goals eat a shoe will be at retail by September at the latest and combo by November, and peregrine may have a photo finish for November too. Have you played GKR: Heavy Hitters yet? I just got mine from kickstarter and am really enjoying it. I signed up as a Champion and then went to pre-order the viticulture expansion as noted in the newsletter. While applying the promo code did give me free shipping, I did not notice a pre-order discount as mentioned in the newsletter. I haven’t ordered yet as I wanted to make sure I want missing something. I also was having a problem applying the preorder discount for the expansion. I went to the link you posted and still only see the one option. Is there a problem with the Champions listing? Derek: The champion listing is actually pre-discounted, so the only code you’ll need to enter is the free shipping code. Thanks for the response and link! Like Derek though, I’m only seeing the one option for $20, which you mentioned was MSRP. Am I wrong in assuming that is not the Champion discounted version? Also, to clarify, when you said the listing is pre-discounted, did you mean it has already been discounted? Or did you mean the listing is pre-discounted, as in the discount has not yet been applied and should be discounted after the promo code is entered? If it’s the latter, the promo code still isn’t adding a discount. Scott: You may not be signed in to Shopify. If you’re signed in under the e-mail you used to become a Champion, you’ll see the discounted version. You won’t need any promo code other than the free shipping code. When I clicked your link, I wasn’t logged in. I then logged in but still didn’t see it in the shop. After closing the tab and clicking on your link again, it showed up as a separate entry for $16. I guess I needed to be logged in before entering the store at all. Thanks for the help! Can you give us any update regarding the Euphoria expansion? Really looking forward for some time for this one and would like to see if there are any plans for when it might be done. Just read the recent newsletter. I LOVE the work in progress layout. I’m a retailer, and I’d like to order some copies of Visit from the Rhine Valley. Should I set up a retail account on your website, or is it better to place the order through email? Thanks for the latest Stonemaier Champion Update. I’m not color blind but I find it very difficult to read sky blue colored links on a white background. I’ll go out on a limb and say probably most people do too. Stonemaier orange might be a better choice. P.S. Looking forward to hearing about the Puppy Dog euro-game next month, aka “EAT A SHOE”. P.P.S. I thought distributors frown upon publishers giving a discount. Are you enjoying Anachrony? It is one of my favorite games, but it is hard for me to get to the table. I really like how it mechanically integrated time travel! I’ve only played it once, but I agree, the time travel is really interesting! Are you announcing “Eat A SHOE” to next Wednesday early to Stonemaier Champions or to the world at the same time? Have you ever considered making a contest game out of your codenames the week before announcing them? Whoever can guess the theme correctly enters a draw to win free shipping to anywhere and a 25% discount. It’ll go out in our e-newsletter to everyone on Wednesday. That’s a fun idea, but I don’t want to encourage people who know what it is to let the secret slip. True, that could easily happen. My Little Scythe getting a full release? That is tremendous news! That art work is lush. A new game for my little spud to play alongside stuffed fables? Heck Yes. Congratulations everyone, especially Hoby and Vienna. I love that they’re credited on the box. This is the sort of event that makes this industry so fantastic. Just out of curiosity, out of the games scheduled to be released, which ones are you designing? Cory: While I work on all of the games we publish, of the new games on the list, I’m the designer for Wild and Clay. Excellent. Thank you! I look forward to more news about them. Hope to be able to check out the Mox event in Seattle. Not at all sure I’d call Mox’s location as “near the zoo”, however. Thanks for the update, looking forward to rise of Fenris. Which brings me to my question: As pre-ordering the expansion in the US is rather costly and little scythe is also sold out at my end of the world (Germany): Will you be attending the Spiel 2018 in Germany and will you bring along the rise of fenris expansion and my little scythe for us to buy it from your own hands? Thorsten: Stonemaier Games won’t be at Spiel 2018, but it’s possible our German partners will have the German versions of our games there (they might be saving some copies just for Essen). Just out of curiosity, if you published a game from another designer based in Europe, would you want to have them represent Stonemaier games at their local conventions like Essen or UKGE? What if they Wanted to? I’m sure any designer proud of their creation would want to actively promote it. Definitely! We’re happy for our designers to share their games in ways they enjoy. *hopes to be Stonemaier published for UKGE next year ?? I notice that the in dev game “Combo” is inching ever closer to production and launch. Since it doesn’t appear to have applicable Solo design and testing, would this be the cooperative game you’ve hinted at? When can we expect more details? Inquiring minds (including my wife) want to know! I just got Rise of Fenris and I wanted to give a major shout out to you for using the nice coil binding on the episode book. It may seem small to some, but proper binding for a book you will need to flip through a lot is really important. There is really nothing better and I have seen plenty of games with a campaign book of some kind that falls apart and has to be re-bound. The rest of the components are of excellent quality as well. Thanks Nick! I like it when people notice the little details. It was an extra expense, but due to the way we structured the scenarios (read the left page before you play and reveal the right page at end of game), I deemed the spiral binding necessary for the expansion. First, is there any way these comments could be reverse-time ordered (i.e. newest to oldest) so that one doesn’t have to scroll down an increasingly longer list of comments to get to the recent comments (as well as add one)? Second, in your newsletter today you mentioned one of the games you’ve been playing recently is Root. I know its not one of yours – care to comment on what you think of this game? I’ll see if I can reverse the comments for this specific post, but I’m not sure I can do that in an isolated way. Hey Jamey! I find that this new (is it new?) addition to the news page where the production schedules appear is a very cool and useful idea. Jordan Draper just did this recently too, on his newly-updated site and I find it to be quite refreshing. I had a few questions regarding that information and I also had one comment, if I may. The comment is just that even though I had seen the page before, I had to Google your website and the word “timelines” before I found it again. This is because it’s hidden under the “News” section, and while that makes perfect sense, it is a bit unintuitive for me. I realize that you get unsolicited advice all time, so I’m not advising it to be moved, simply providing you with some data from my user experience. 1) After reading your article about your designer contracts, I’m surprised to see that “Art” comes before “Blind Playtesting”. In the process of things, I totally get this order, but it would seem that your contracts allow you to take a big financial risk if you are having art done at a time when the contract can still be canceled for any reason. Could you shine some light on why you’ve set it up this way? I have some assumptions but I’d rather not lean on them. 2) I noticed that after “Blind Playtesting” you then proceed with “Graphic Design”. Is part is quite confusing for me. I would assume that the graphic design is even more crucial to the blind playtesting than the art is. Perhaps the timeline sections are not super strict, but I would love to know more about precisely what is included in each of these steps. That’s it from me, thanks for any answer you are able to provide and no worries if any of the above is a bit of a trade secret and can’t be shared. Keep up the great content and awesome games! I’ll do my best to answer your questions! Also, I should say up front that many of these things happen in different orders and simultaneously. There’s lots of overlap. 1. Honestly, I’ve never felt at risk of a designer pulling a game from us after we’ve already started to invest time and money in it. I think those red flags would have shown up earlier in the process. 2. Graphic design definitely follows blind playtesting. Like, imagine a game that you’re currently working on. You haven’t blind playtested it, but you proceed to send it to your graphic designer to lay out the board, tiles, etc, create icons, populate text, etc. Then you blind playtest it for several months, resulting in significant changes. How is your graphic designer going to feel when you tell them to redo 90% of the work they already completed? Sure, you need to have a playable prototype, and sometimes I enlist the help of my graphic designer for a few icons at that point, but I’ve learned to wait until the game is very close to being complete before I bring in my graphic designer. First of all i wanted to thank you for the great work you have done. I have been a fan for a long time and now finally decided to post on the site. I wanna say im quite excited about the possibility of having another kickstarter run by you. For me the whole kickstarter is about the experience, with communication being a great part of it. I love the amount of communication shown in for example the tidal blades kickstarter. What do you think about using this type of heavy communication as a type of extra selling point for the project? Thanks Jean-Carlo! I liked to run my projects with updates every 2-3 days during the campaign and every 1-2 weeks after the campaign, with an hourly active presence in the comments. My personal preference is for a creator not to post more than 1 update every couple of days–if I’m getting daily updates (or more than 1 update a day), it’s too much for me, and I tend to unsubscribe to them. On this month’s survey, the last question (which Stonemaier game we don’t own, but wish we did) should allow for multiple response or be rewritten to signify which game we don’t own, but MOST want. I am interested in becoming a Stonemaier Champion. If I sign up today, is it good until 12/7/19 or just until the end of 2018? It’s good for 12 months after the date you sign up. Is there by change for a lower shipping costs for Canada for Wingspan since you mentioned the games are already in Canada awaiting fulfillment? Is $14 the lowered shipping cost from the European fulfilment center to the UK? Thanks. Yes, that’s the correct shipping, packaging, and handling fee. Thank you. I have just become a Champion ($12) and ordered Wingspan(-$10). It looks fantastic! Congratulations to you and all of the design team. The Champion membership is a great idea. You must be getting ~$30k each year. (I don’t know if other publishers are doing this yet). It is well deserved due to everything you do. I received a book for Christmas written by Gabe Barrett, which led me to his podcast, and he had many great things to say about you! I love my copy of Scythe and I’m sure Wingspan will be awesome too! Keep up the hard work. It is greatly appreciated. Thanks Tom! I appreciate all the support people have shown for the content we create, and hopefully they’re benefiting from the perks provided by the Champion program. And Gabe is great! It’s an honor to have a chapter in his book. When can we expect to see some of the expansion content available for Scythe Digital? Really enjoying it so far, but really want to get some reps in with the Invader factions and run the gambit of Wind Gambit content. That’s a great question for the Scythe Digital team–I really don’t know. Is this the correct place for discussing the January 2, 2019 Newsletter? This is where the link took me, but it doesn’t look like the Newsletter I received in my email, just now. Also, the link for the Demographic Survey takes me to one from 2017 about Gender, etc. Shouldn’t there be one from last month? I’m a software developer by day and independent game designer and publisher by night. In an effort to improve my game project management skills, I’d like to ask some questions regarding your approach to project management. My apologies if you have answered this question already (I couldn’t find it). 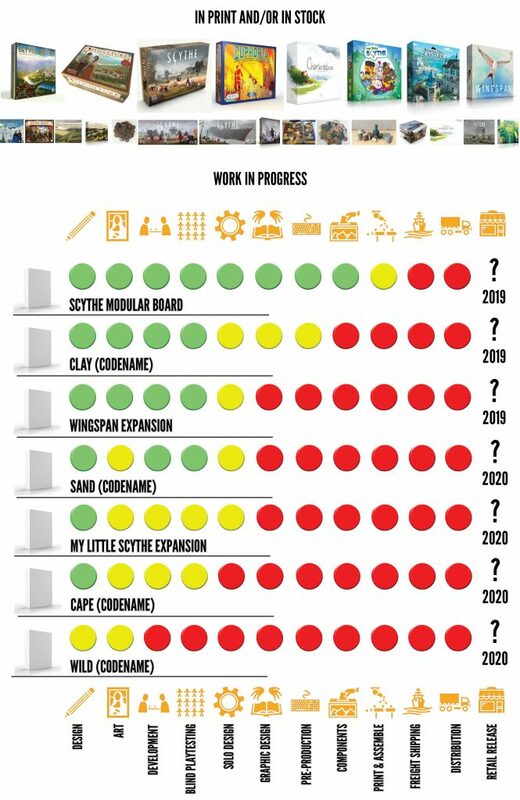 In your Newsletter’s Work In Progress section, you mention various stages of progress represented by green, yellow, and red. I assume green is “complete”, yellow is “in-progress”, and red is “not started”. The graph is pretty straight forward and each project seems to flow from left to right. 1). Do all of your games follow this process flow? 2). Could you provide some simple definitions for each step in the process so that I can better understand its context? This is where the link took me, but it doesn’t look like the Newsletter I received in my email, just now. Thank you for providing a timeline that shows what to look forward to from Stonemaier. I am excited to see the first Wingspan expansion already in the playtesting stage. Also very intrigued by what “Clay” and “Sand” will prove to be. I hope you use a similar approach as you did with Wingspan in revealing things gradually about them as they approach their release date. I just signed up as an ambassador yesterday. I would love to be of help with proofreading or playtesting if you ever have a need. Thank you also for providing these various ways to connect with your company, hear your thoughts about gaming, and feel a part things, even if it is just to be part of the cheering section. I am gaining a much deeper appreciation for what is involved to be a publisher or designer. Jamey, what do you think of AuZtralia?? Are rules like banned combo mats in Scythe official? Is there a place where post-release rules for the sake of evening things out are collated? So amazing that the templates for cards was shared. Is it possible to get the template for Viticulture Mama and Papa cards? A friend would love to have a custom Mama card to give to her Viticulture-loving mother on Mother’s Day. Currently we’re just providing these templates, but perhaps the visitor card template can be used for that gift. So cool that these were made available, thanks for doing that!